VENTURE/SCIENCE is a venture capital firm in Silicon Valley that applies rational fund management principles such as stochastic finance and multi-factor selection models to venture capital. His professional background spans ecommerce, analytics, behavioral economics and decision sciences. A Turkish-American businessman, Oguz graduated from Bosphorus University in Istanbul, the first American university outside the US and the country�s equivalent to our Harvard, with a bachelor�s degree in civil engineering. With full scholarship, he then earned an MBA degree in Decision Sciences from Georgia State University Robinson College of Business. 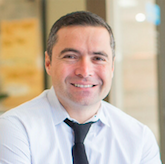 Oguz started Venture/Science in 2012, a new generation venture capital fund that pioneered the data-driven "moneyball" approach to venture capital. To list your Company on our website and make your profile available to Matt and 7,500+ other VCs and Angel Investors, Click Here.